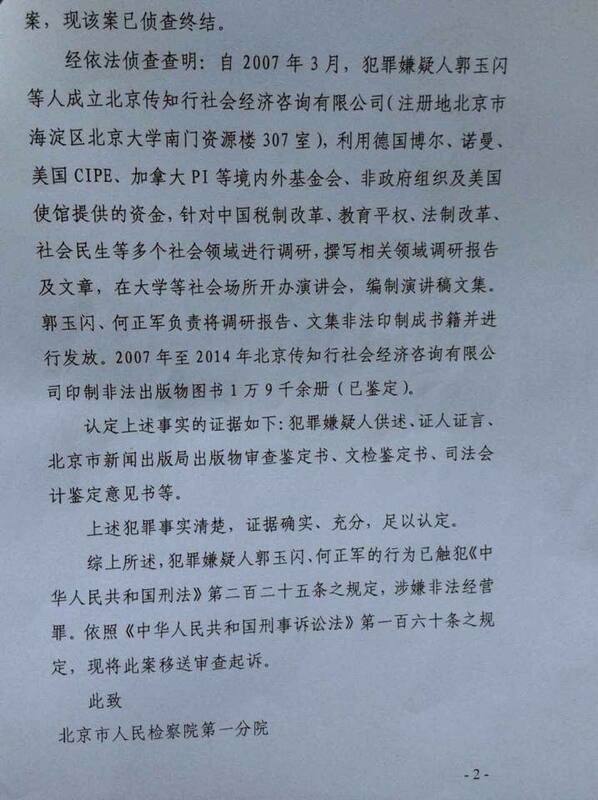 In its recommendation to indict Transition Institute founder, Guo Yushan, and administrative director, He Zhengjun, for “illegal business operation,” the Beijing Municipal Public Security Bureau said that the Transition Institute wrote research papers and articles and offered lectures at universities on such subjects as China’s tax reform, education rights, and legal reform using funds from domestic and international foundations, including Probe International. The police claim to have uncovered the alleged “illegal” activities while they were investigating Guo Yushan, an economist, for the suspected crime of picking quarrels and provoking troubles. “Criminal suspects Guo Yushan and He Zhengjun were captured and brought to justice on October 9, 2014 and November 26, 2014 respectively,” the Public Security Bureau says. An English translation of the Recommendation for Indictment (found in Chinese here) follows. Suspect Guo Yushan, male, born August 2, 1977, ID: xxxxxxxxxx, Han nationality, master’s degree, legal representative of the Beijing Transition Economic and Social Consulting Limited Company, home address: xxxxx, Xi’erqi, Haidian District, Beijing, was detained on suspicion of picking quarrels and provoking troubles by this bureau[i] on October 9, 2014, and lived at home under surveillance from November 8, 2014. 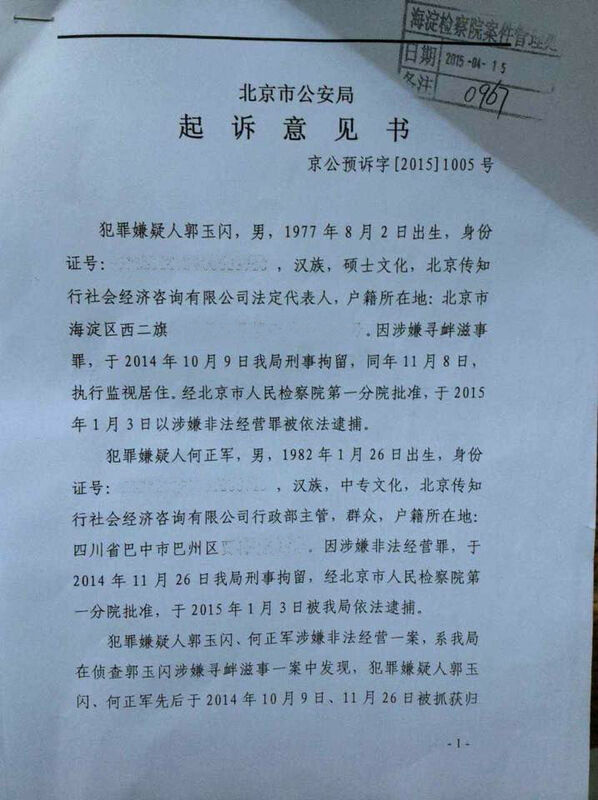 With the approval of the First Branch of Beijing Municipal People’s Procuratorate, Guo was charged with illegal business operation and arrested on January 3, 2015. Suspect He Zhengjun, male, born on January 26, 1982, ID: xxxxxxxxxx, Han nationality, graduated from a secondary technical school, administrative manager of the Beijing Transition Economic and Social Consulting Limited Company, home address: xxxxx, Bazhou District, Bazhong City, Sichuan Province, was detained on suspicion of illegal business operation by this bureau on November 26, 2014. With the approval of the First Branch of Beijing Municipal People’s Procuratorate, He was arrested by this bureau on January 3, 2015. That criminal suspects Guo Yushan and He Zhengjun were involved in illegal business operation was discovered during this bureau’s investigation into Guo Yushan’s suspected crime of picking quarrels and provoking troubles. Criminal suspects Guo Yushan and He Zhengjun were captured and brought to justice on October 9, 2014 and November 26, 2014 respectively. The investigation of the case is now complete. Our lawful investigation found that in March 2007, criminal suspect Guo Yushan and others established the Beijing Transition Economic and Social Consulting Limited Company (the registered address was Room 307, Resources Building of the South Gate of Beijing University, Haidian District, Beijing). Using funds from Bo’er [Heinrich Boll Stiftung] and Nuoman [Friedrich Naumann Stiftung] in Germany, CIPE [Center for International Private Enterprise] in the United States, PI [Probe International] in Canada and other domestic and foreign foundations, NGOs and the US Embassy, Guo Yushan and TI carried out surveys and investigations on China’s tax reform, education rights, legal reform, people’s livelihoods and other aspects of society, writing research reports and articles, offering lectures at universities and other social venues, and producing anthologies of speeches. Guo Yushan and He Zhengjun were responsible for the illegal printing and distribution of these materials. The Transition Institute printed 19,000 copies of illegal publications and books between 2007 and 2014 (this has already been identified and confirmed). The evidence to affirm the aforementioned facts consists of the following: the confessions of the suspects, witness testimonies, the examination and appraisal report on the publications by Beijing Municipal Bureau of Press and Publication, document retrieval testimony, forensic accounting report and so forth. The facts of the crime stated above are clear; the evidence is reliable and ample, and is sufficient to affirm [this indictment]. In summary, the behavior of criminal suspects Guo Yushan and He Zhengjun has violated Article 225 of the Criminal Law of the People’s Republic of China; thus they are suspected of illegal business operation. In accordance with Article 160 of the Criminal Procedure Law of the People’s Republic of China, the case is now being transferred for review and legal proceedings. 36 volumes of pre-trial files of the case. Criminal suspects Guo Yushan and He Zhengjun are currently being detained at the Beijing No. 1 Detention Centre. [i] “This bureau” refers to the organ that issued the document, the Beijing Municipal Public Security Bureau. Monday, June 1: Li Jin, one of two lawyers representing detained Transition Institute (TI) founder, Guo Yushan, said the People’s Procuratorate of Haidian District (which took over the TI case from the First Branch of Beijing Municipal People’s Procuratorate on April 15) returned the case against Guo Yushan, and TI administrative director He Zhengjung, to the police authorities for further investigation on May 30. 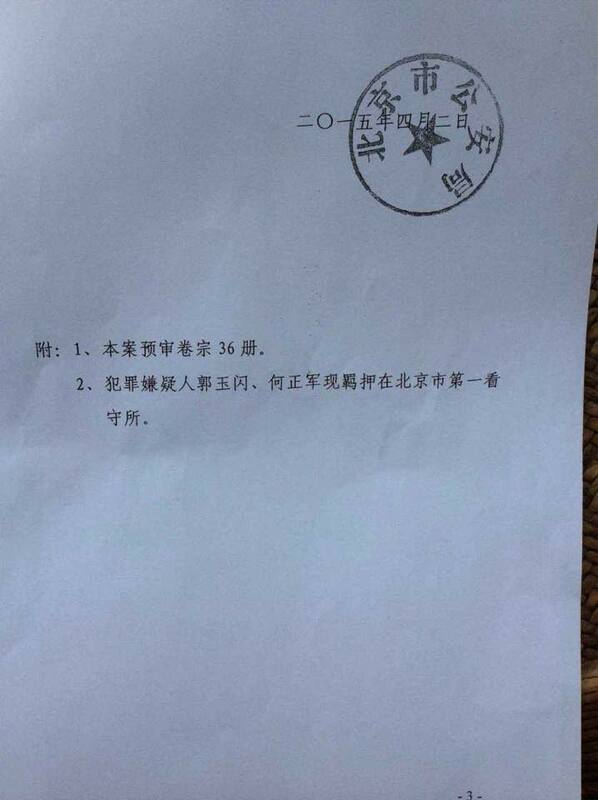 According to China’s criminal procedure laws, the time limit for further police investigation is one month. Upon completion, the police are likely to recommend to the Procuratorate that the suspect be indicted but the decision by the Procuratorate could take another 1.5 months. The case can also be returned to the police for further investigation again if the Procuratorate considers existing evidence insufficient. The maximum number of times a case can be returned to the police for further investigation is two times. Therefore, the decision whether or not to indict Guo Yushan and He Zhengjung could take five more months in total if the Procuratorate deems the maximum number of reviews permitted by law are necessary. For background reading on China’s crackdown on NGOs, both domestic and foreign, see: China set to step up control over NGOs by China Digital Times, published March 12, 2015. Your Honor my name is Mark Gilbert Jenkins. It is a pleasure to finally know your name and what you believe in. Congratulations on your appointment by Our General Secretary, Xi Jinping, to Head the Military and Police Reform in Beijing. This is, I believe , important work to continue building confidence with foreign Investors. Another issue that have an impact on Foreign Investor Confidence is the organized crime that ocassionally raises its head against foreigners. I can attest to the destruction that these Mafias can unleash on our peaceful Beijing communities. During the las two years I have been in a living hell. These gangs, some based in Andingmen and some based in Fengtai have sought to destroy all confidence that I, my family and friends in the peacefull co-existence we all enjoyed over the last 8 years. I have conducted classe in China with children, highschoolers and with your prestigous niversities the past 4 years. My claase emphasize Academic writing and understanding the reasoninfg behind truth (T1). Beijing University of Technology BJUT JCU program, New Oriental XDF Weigongcun program, Capital Medical University CCMU program are just 3 of the many higher learning programs these criminal individuals have infiltrated. The harassed me and my family by intimidation, following us, hacking or emails and WIFI, contacting an bribing our school administrators, scheduled fake classes for the purpose of ambushand followed me to various countries during Spring Festivals. The goal seems to be to perform the ancient Chines castration ritual to their contituents. I have sent you names and pictures on previous emails (i appologize for the sloppy presentation of this information,. All of my computes and phones have been hacked by the Knifers, hackers, intimidators and embezzlers. I am writing uou because I am seeking your help obtaining protection for my family. I cannot just fly off to the United States an forget my fsmily of 8 years. They would not be able to join me; and, their Party affiliation does not allow them to all leave China at the same time. Pleas ehave your staff contact me and higherlevel officials to look into my CRIMINAL COMPLAINT. It seems some of the local Police offices have also been intimidated or believe the slanderous stories these community thugs portend.